As a supermarket chain serving consumers in the state of Oklahoma in America, Crest Foods of Oklahoma, sells an array of products including fresh produce, baked goods, such as bread and cakes and other everyday basics. The history of the company begins with Nick Harroz Senior, who moved himself and his family to Oklahoma City. Once they were settled, they started their business with a modest grocery store known as Fairview Grocery. The motto of the family business in the beginning was “Stack it high and sell it cheap!” and it appeared to work for the company. This business inspired his son, Nick Harroz Junior, to start his own business. However, he did not follow his father’s footsteps straight away, as he first became an officer in the Army where he trained fighter pilots. At the end of World War II, he returned to Oklahoma City and opened his own grocery store called Nick’s Brett Drive Grocery. Once married, Nick and his wife decided to expand the business during the 1950s and 1960s and the most prominent development in this time was moving the store location to a shopping center called Ridgecrest Shopping Center. Along with this move came a name change and the company rebranded the store as “Crest” to fit in with the surrounding shopping center. The next few decades were deemed an overall success for the business and the couple felt it was time to expand the business again. 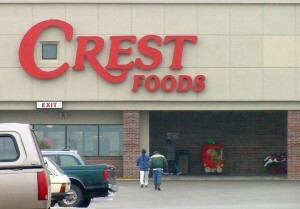 In 1984, they added two new stores to start the Crest chain of supermarkets. By this point, the couple was looking forward to their retirement so they passed on the family business to their son, Bruce Harroz. Even though the motto had been passed through two generations, the idea of piling the shelves high and pricing the products cheap was still going strong. Bruce was keen to expand the business just as his father had been in the later years and opened another four branches between 2002 and 2010. I just purchased a few groceries at Crest. There was a large , full display of strawberries. Looking them over, I saw mold in the package I picked up–I saw many of the others were in the same condition. I pointed this out to a store person, who removed one bag. I bought no strawberries. I did buy a bag of SunKist oranges–three had soft moldy spots, I ate one that wasn’t moldy, which was not eatable. I’m not sending this to get any “free” coupons or anything like that–it’s to let you know that Crest Foods needs to hang a “Buyer Beware” sign over the fruits and veg. I just have a question..do you have a website where I can pull up and make a list of the items I need that would include the product name…it’s becoming very difficult of me to go do the shopping. My husband can but doesn’t always buy what we need plus I can’t remember the names, like I’m wanting some frozen items but don’t know the item by name. We shop in MWC on Douglas.